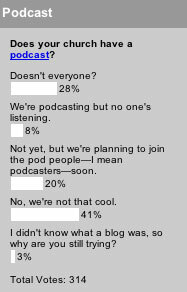 Last week we checked on the popularity among churches of the most popular tech trend in 2005, the podcast. 36% of churches are currently podcasting and another 20% are planning to start one soon, which means just over half of churches are hip to the latest trend. Not too shabby. Of those churches podcasting, 8% did report that no one’s listening, so it’s not the killer application for everybody. As holy week starts the countdown to Easter we ask what your church is doing to draw people in for one of the biggest days of the year. It should be interesting to compare Easter plans with the other big holiday, Christmas. We started uploading MP3s of the sermon about 6 weeks ago. I haven’t set up our website to track downloads, but will soon. Today was the first day that I uploaded the message improperly, uploading the wrong filename. I was surprised completely to get 3 e-mails from people who couldn’t download the message. We don’t advertise that we have a website yet (it isn’t really functional as I believe it should be), but to know that people are downloading them was a huge blessing to know that the work was put to good use already. The next step is to give the file a feed so it can be shared through the various podcast software — if people are truly interested in that step, I might as well give them the best opportunity to grab it. My biggest problem is how to work with our “old fashioned” pastors to get them to create their messages in a way that is best suited to not just the now-listeners but those who might listen in later. As the guy-who-runs-sound, it is very hard to put a message online that was given in a two-directional fashion (interaction with the listeners) and then try to listen to it in unidirectional way. How do you track downloads? Can someone point me to how you can do that? AWstats (awstats.sourceforge.net) – FREE – An excellent, open source statistics tracker based on Perl. Uses the server logs to parse the stats via a CRON job. Also archives all stats permanently. There are also various “free” web statistics generators, like freestats.com and Google Analytics (analytics.google.com), some good some not. At NCC, we use a both AWstats and Mint. (2) Feedburner – http://feedburner.com – This is a more comprehensive option, as it will parse your xml (ie podcast) feed into something several rss aggregators can read, then download. There are charges for advanced stats, but you can use the simple stats for free. The tracking interface is very well thought out! I’m using feedburner as I write …. I’ll add to this post as my tests continue. That’s great that so many churches are getting into the “podcasting” thing, but I do wonder if simply putting up an MP3 of last Sunday’s sermon is really podcasting. An audio recording? Yes … and well worth doing. But should it be called a podcast? Probably not. I know it’s just a label, but a “label” says a lot about a product … and I’m just not sure that the term podcast is a suitable description for a straight MP3 recording of a sermon. Does this resonate with anyone else out there, or am I seriously missing the point? If an MP3 has a consistent URL, there is no reason NOT to Podcast it. The only difference between an MP3 download and a Podcast is that it is an MP3 with an RSS syndication informing Podcast clients that an updated or new MP3 file is available. I know that this is an OLD post, but I’d like to respond to the question asked by Darryl if a sermon recording is a podcast. First, since the definition of a podcast is basically what AB Dada said (an audio file with an RSS feed), then, by definition, a recording (audio or video) posted onto a website with an RSS feed IS a podcast.